When it comes to investing in Bitcoin and other cryptocurrencies, purchasing and trading are merely one facet of it. In fact, your Bitcoin and crypto investments could be ultimately nullified should you fail to adequately protect it post-purchase. In this blog post, we’re going to walk you through three (3) of the best Bitcoin wallets for cold storage in the present day crypto-wallet ecosystem. Before diving into three hardware wallets you should consider using, just remember, never invest more than you’re prepared to lose, and start considering storing your crypto funds with cold-storage after you’ve accumulated more than a month’s worth of your salary (or more than you are comfortable losing). 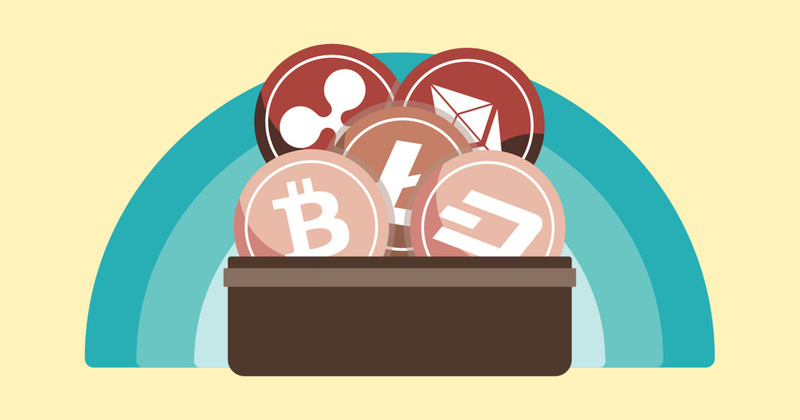 Just as you’d take the necessary steps to secure you fiat holdings (think USD, EUR, and GBP), you should be taking similar protective measures with your crypto – doing so could ultimately save you headache and hassle in the future. A small investment in security now, could go a long ways in the future. Note that we’ve tried and tested all three! It’s time you start ranking! While still yet to be recognized in the same breath with cryptocurrency wallet titans (ex. Ledger and Trezor), the CoolWallet S is the best Bitcoin hardware wallet you’ve never heard of. 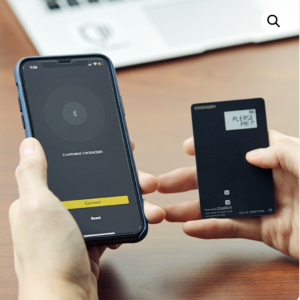 Specifically, the CoolWallet S is a Bitcoin and cryptocurrency hardware wallet, which enables users to secure their cryptocurrencies at their fingertips. Keep in mind that the CoolWallet S stores BTC, BCH, ETH, XRP, LTC, and all ERC20 tokens. It’s geared towards portability, and at the forefront of bridging the gap between everyday life and blockchain. Anonymity: completely anonymous and requires no actual registration. Easy-to-Set-Up: allows users to secure their investment with minutes and does not require the use of clunky USB cables. Durable: tamper-proof, waterproof, impact resistant, and heat and cold resistant. What makes the CoolWallet S worth keeping an eye on is that it has eliminated a single point of failure, meaning users can rest assured their funds are completely protected. In order for a malicious actor to access a CoolWallet user’s funds, they would need to gain control of not only a person’s CoolWallet, but smartphone or table too. Mix in the fact that they’ve partnered with MetaCertProtocol – the world’s largest verified address database – and users can sleep easy knowing they’re doing cold storage right. Finally, they’ve partnered with several exchanges to sanction transactions between a user’s wallet and exchange on the go. To read up further on CoolWallet’s unparalleled mobility and Bitcoin storage capabilities, head on over to their website and check out their FAQ. 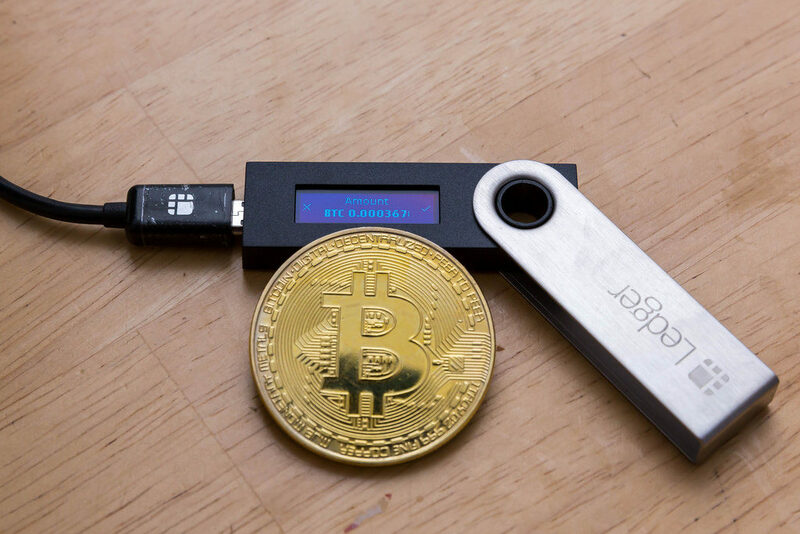 The Ledger Nano S is one of the most popular options when it comes to Bitcoin hardware wallets and cold storage, as it boasts some of the best coin support and comes in at the cheapest of all three options (at EUR $79). Furthermore, they’ve been around since 2014, and sold their one millionth Nano S device in January 2018. They also boast revenue estimated just over $90 million, meaning it’s one of the highest selling hardware wallets in all of crypto. The Ledger Nano S boasts state-of-the-art security, and makes sure your private key is never exposed. Additionally, it’s simple, and can be controlled with just 2 buttons. Finally, it’s worth mentioning that the Ledger Nano S is so secure, that is can be used on corrupted and infected computers. So, if you’re looking for a Bitcoin wallet that has been through the ringer, is affordable, and boasts some of the best coin support in the hardware ecosystem, Ledger has all three. You can check out their coin support here (they’ve just added support for Monero as well). To read up further on Ledger and understand why they are at the forefront of cold storage, head on over to their website. The other top dog in the game who you’ve probably heard mentioned with Ledger is ‘Trezor’. 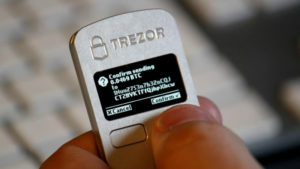 Trezor touts itself as THE “original Bitcoin hardware wallet,” and at date of publish, supports nearly 700 tokens and altcoins. Trezor has partnered with MyEtherWallet for interacting with the Ethereum blockchain, and ultimately your ETH funds. They place notable emphasize on the device’s incorruptibility, and like Ledger, state that Trezor can be used with an infected and corrupted computer – and it actually poses no real threat to the state of your Bitcoin and crypto holdings. Furthermore, Trezor utilizes an ingenious PIN entry mechanism, to further eliminate the chances of a malicious hacker/attacker accessing your funds. After every incorrect PIN guess, the amount of time for which a person has to wait before entering the pin again doubles. For example, if a user were to enter 15 incorrect guesses, it would take them a total of 18 hours. Don’t believe us? Check out this Wired.com article about their editor who forgot his PIN and estimated that he would likely be deceased before his 31st guess. With a quick and easy set-up time of under 10 minutes, a simple and straightforward “plug-n-play” interface, and robust coin support, you can’t go wrong when choosing Trezor as your Bitcoin or cryptocurrency hardware wallet. You can read up further about Trezor and its nearly 700 supported coins and tokens by checking out their website and blog. And there you have it, three of the best Bitcoin wallets in today’s cold-storage ecosystem! If you have any Bitcoin hardware wallets you think are worth checking out and using, let us know! Finally, if you’re a blockchain company or law firm and are looking to boost your online presence, reach out to Blockchain SEO today for your free website diagnosis and consultation. At Blockchain SEO, we’ve overhauled content creation, production, and gameplans for several high-profile law firms and blockchain projects, enabling them to not only increase traffic, but conversions as well. Reach out to us today by filling out our contact form or emailing us at owen@blockchainseo.net. Let us help you craft your online presence and narrative.